The apparent lapsus linguae occurred at the tail end of today's advisory board roundtable. Trump wrapped up with closing remarks pertaining to the health of the country's economy, lauding Apple's efforts to return offshore capital to the U.S. through strategic investments, special projects and taxes. "People like Tim — you're expanding all over and doing things I really wanted you to right from the beginning," Trump said. "I used to say, 'Tim, you've got to start doing it over here,' and you really have. You really put a big investment in our country. We appreciate it very much, Tim Apple." As noted by CNBC, which televised the meeting, Trump is known to assign nicknames to prominent corporate executives. Likely used often behind closed doors, the monikers sometimes make it into public discourse. Last year, Trump referred to Lockheed Martin CEO Marillyn Hewson as "Marillyn Lockheed." Trump sometimes invents epithets to spite competitors or rivals, a tactic he used to great effect during the 2016 presidential elections. While the name calling has slowed since Trump took office, he sometimes returns to the practice. An example germane to "Tim Apple" is "Jeff Bozo," a name Trump foisted on Amazon CEO and owner of the Washington Post Jeff Bezos. The Post is often critical of Trump's political moves. The "Tim Apple" slip-up is a reminder of Cook and Trump's sometimes contentious history. On the campaign trail in 2016, Trump called for a boycott of Apple after the company refused to assist the Federal Bureau of Investigation's attempts to crack an iPhone used by San Bernardino terror suspect Syed Rizwan Farook. 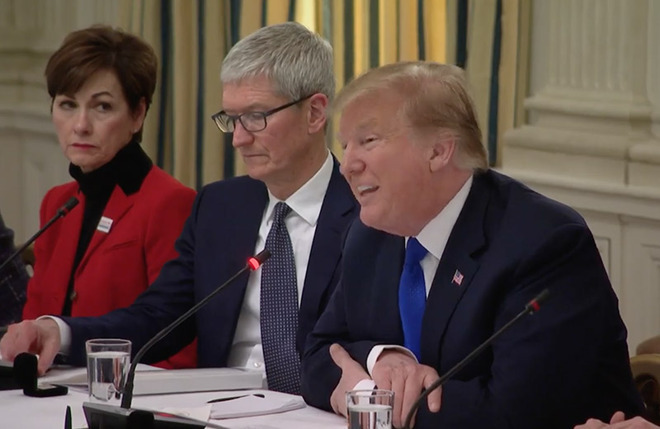 He further railed on Apple for outsourcing manufacturing to China and called on the company to bring those jobs to plants in the U.S.
Cook has in the past taken umbrage with Trump's policies, both during his campaign and as a sitting president. Often arriving in the form of corporate letters and backing of non-profit causes, Apple under Cook has been an outspoken critic of the president's views on LGBT rights, social inequality and immigration. Still, Cook is one of very few tech industry elite willing to sit down with the president and his aides. Cook's prowess as a lobbyist has reportedly put him in Trump's good graces, at least publicly, and has helped Apple avoid fallout from the U.S.-China trade war.